As I’ve said elsewhere, I’ve long been fascinated by Green Men. I’ve only figured out recently that this may be because my own father was a Green Man. It’s funny the things that set you to remembering. The other day when I was in the cafeteria at work, I had a semi-meaningless conversation about pickles. That conversation sparked a memory so keen I had to write it down immediately. My father planted a vast vegetable garden every year in the immense back yard of our rental property in Venice. He had no tolerance for flowers and, like as not, he’d pull them up if he needed more space for edibles. Still, the garden he planted was a work of art: lovingly conditioned soil, weeks in churning and amending, row upon neat little row of carrot, onion, parsnip, red radish, bell pepper. Beyond those rows, beautifully rounded little mounds held cucumber, ringed round with carefully dug irrigation channels. The leaves of the cucumbers were hairy and pointy-edged, the stems thick and fuzzy, bobbing green in the summer breeze, yellow in the fall. The tomato plants on the other side of the cucumbers always started in orderly, well-staked rows, but by fall they danced in an entwined frenzy. Along the back fence, wire with a spiky top, banana squash climbed. Sometimes corn grew beside it. Between the back fence crops and the tomatoes ran an arbor for string beans—a porous frame of wood and chicken wire during the fallow months, ten feet tall and perhaps twenty feet long. 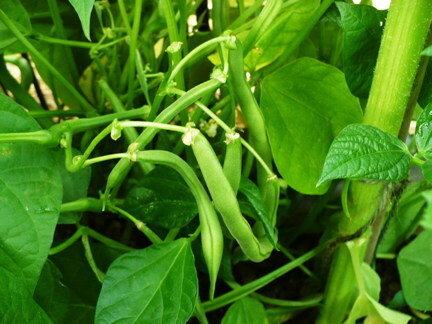 In the summer months, though, it became a green tunnel as the beans climbed up the sides and over the top. The sun shone liquid green through the leaves, and even in the hottest summer the earth beneath—near-black with fecundity and never dried completely during the growing season—felt cool to my bare feet. That soil made all things seem possible. I would wander up and down it daydreaming, getting a buzz from the green smell of the beans. If ever there was a place my soul felt repose, it was there. I suspect my father felt the same way. He preferred spending time in his garden, in the green bean tunnel, to time with my mother and I. Perhaps that wasn’t so, just my perception, but it felt to me as if he couldn’t find a way to bridge the gap between that shining green light and the warmth of the hearth. After the day’s gardening, he seemed empty and at a loss. The demons that tormented him grew thicker in the air. He’d nearly reached retirement age by the time I was born. When I was small, I adored helping him in the garden, just being with him. When I hit puberty, our worldviews had grown too divergent. At least two generations separated us, and only in the green space had we any hope of reaching across the decades. Even in puberty, the garden and that cool green tunnel seemed like a magic place. When the churning of my brain and growing body got to be too much, I’d return to it and wander up and down. I had this feeling, way down deep, that if I could just make it to the end of that tunnel, the true end, not the one I saw with my eyes, I’d be changed. Or maybe all my wishes would be granted. I never made it that far. I’d see Dad in the tunnel, slowly walking up and down, lifting the bean pods tenderly in his hands to check their progress, seeing if they were ready for the ritual of the canning process. Mom and I were not allowed near the kitchen when the canning sacrament was underway. Mornings in late summer and early fall, I’d wake to the smell of green beans cooking, ready for the mason jars; or dill, alum, and vinegar boiling to turn fresh-picked cucumbers into the best pickles in the world. An astringent smell, but to me it held the promise of something delicious in the heart of winter. I still see my father in that garden, and wonder what he found when he took the final walk to the end of that shining green tunnel. I wonder if his wishes came true? The lovely lady to the left of him is the Roman goddess Flora, and the lady on the right is simply named Ivy. The man himself is cast iron and ages gracefully, rusting in interesting patterns. He’s smaller, also made of metal, but I doubt he’s copper as the green of him suggests. I believe the “aging” on this one is artificial—but I still think he’s rather cool. I’d have more Green Men if I had the space and money (so it’s probably a good thing I don’t). 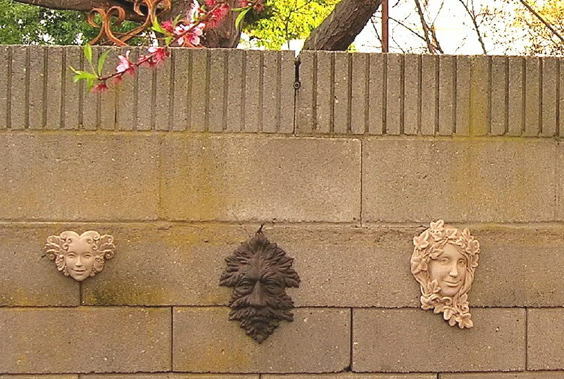 I like the ones with serious and slightly sinister expressions, and I like them to be made of serious natural materials like metal, not these comical cast resin ones that you see here and there and everywhere (though I admit, Flora and Ivy are cast resin). 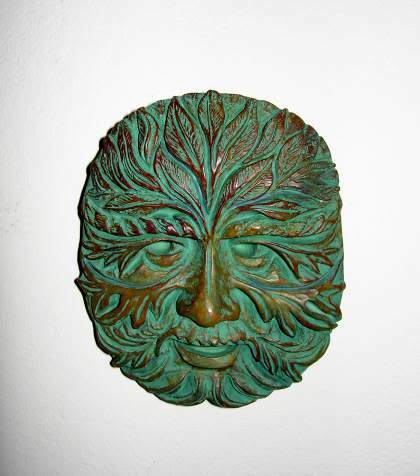 Why am I so fascinated with these Green Man images? I’m a city girl, born and raised. If I want to get in touch with Serious Nature, I have to drive quite a ways out of town, and when I was a kid we never left town, unless it was to drive to Pomona for the county fair or to Disneyland in Anaheim. There wasn’t enough money for anything else, nor any time and inclination with my parents working hard. It just wasn’t in the program. As a consequence, I was 18 before I ever went on a real vacation, and as for nature spots? Mom didn’t see much sense in going places where you had to sleep on the ground and cook over campfires. She’d had enough of that “nonsense” in her roughing-it country girl days and found no romance in the experience. Why would any sensible human being want to give up modern conveniences? So I grew up having to take nature where I found it. Fortunately, back in the olden days of Los Angeles, there still existed patches of it here and there. An immense vacant lot existed on my block on Fourth Avenue in Venice, for one. (It is now a public storage facility.) For another, my father planted a magical garden every year, a place of communion and nourishment. (I’ll discuss that another time, in The Green Man, Part II.) Occasionally, I got to visit my older brother in the Santa Monica mountains, where my nieces and nephews (all mostly older than me) would lead me on fantastical trips over the hill and through the woods following streams…until we popped out of the rough onto the manicured lawns of the Bel Air Country Club golf course. Then we’d hightail it back into the woods. These things were extremely important to me, as were long walks on the beach, about five blocks west of where we lived. I loved the beach best when it was cold and rainy, partly because the things that drifted up on shore—the glass, the driftwood, the truly odd and puzzling things, were more interesting and less picked over by other beach walkers. Mostly, though, it was because I could walk there on cold days without much interference from other people, thinking my thoughts, communing with the vast rolling heart of the sea, feeling the chill pierce me to the bones. That chill always felt purifying rather than cold. I could not return from those walks with any black spots in my spirit. The wind off the sea blew them all away and gave me bliss in return. That garden and that vacant lot saved my sanity during childhood; those walks along the sea saved my adolescence. Nature, my small neighborhood version of it, never failed to renew me. That, I think, is part of why I am so fascinated with the symbolic representation of nature: I want to recapture, to remind myself, of that need for renewal, that need to physically get out and get in touch with something green and greater than the mere mortal. In my twenties I went on long hikes in the Angeles Crest. It’s a great, sprawling wilderness within easy driving distance of Los Angeles. Some of it, like Dart Canyon, is at a low enough elevation that on smoggy L.A. days the bad air penetrates them. You have to hike higher up if you want to avoid the city pollution. But on lovely, clear days Dart Canyon is a enchanted place, with maple and sycamore trees, waterfalls, the ruins of cabins and of a lodge destroyed in a great destructive flood in the 1930s. Higher up, there’s pine forest, ski summits, abandoned mines, and scrambling over big boulders to cross streams. Those hikes were literally peak experiences for me: cleansing, renewing, exhilarating. My favorite parts of any vacation, whether in this country or another, have been those times when I get into the countryside, touch the green, listen to the birds, feel the wind sweep through my spirit and blow away the black clouds. Nature is my touchstone. These days—and in the long years of caregiving—that touchstone is mostly limited to the back yard. There wasn’t much time for anything else when Mom was alive; these days I still seem to be decompressing from that experience, trying to recoup my energy and my creativity. I’m far enough away from the beach that I’d have to drive, find parking, and my legs…no. But the funny thing is, it doesn’t really take Grand Nature for me to get that sense of renewal. The Green Man is alive, curling in every leaf and bud; his skin is easy beneath my palm in the smooth trunk of my peach tree; he dances in the swaying branches of the white willow that volunteered to grow in my yard. All I have to do is sit for a few minutes, enclosed by walls and trees and wildish overgrown patches, listening to the birds, smelling peach blossoms, feeling the earth and grass under my bare feet…and the magic still happens. I am there. He is there. I am lifted up, I am renewed. 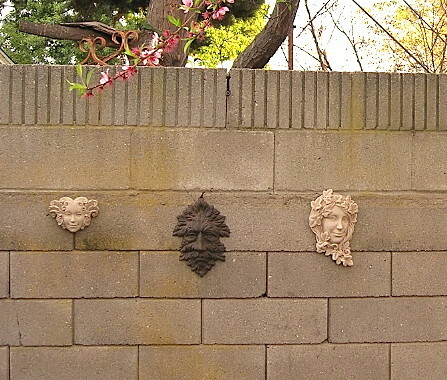 Maybe the Green Man is watching over me, I don’t know. All I know is that I am grateful. You are currently browsing the archives for the green man	category. WordPress 5.1.1 and delivered to you in 0.904 seconds using 34 queries.